Heated debate on an executive bill, which sought to give ownership and control of the water resources sector to the Federal Government, practically split the senate along ethnic and regional lines yesterday. It has already been processed by Senate Committee on Water Resources which chairman is Senator Mohammed Ubali Shitu (APC, Jigawa State) and was to be considered yesterday on clause by clause basis before final approval. But trouble started when Senate Minority leader, Godswill Akpabio, drew attention of his colleagues to the fact that the bill could deprive people living along riverbanks of their basic livelihood. Shitu, who had presented his committee’s report on the bill to the senate earlier, insisted that the Federal Government should be empowered to have absolute control over water banks and resources in Nigeria. 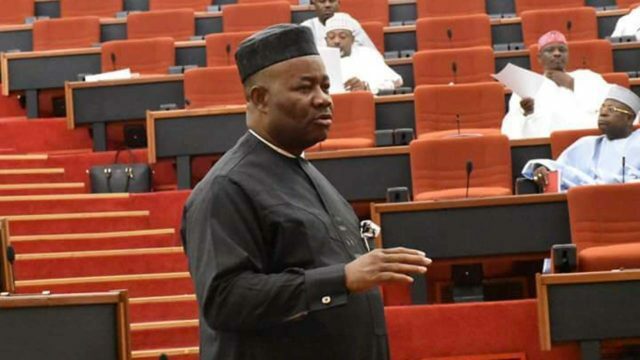 Still opposing the bill, Akpabio who raised issues against Clause 3, warned against making a law that would lead to the Federal Government taking over the landed areas of riverine communities, especially communities where the water bodies dry off. Akpabio made reference to Lake Chad which water he said used to cover 25,000 kilometres of land but had dried up to about 5,000 kilometres. He said it meant that the community now had 20,000 kilometres for farming and other activities, stressing that it would have been out of the reach of the people if the government had possessed the bank. Senator Emmanuel Paulker (PDP, Bayelsa-Central) supported Akpabio, noting that there was a need to define what a bank is. He also pointed out that the Federal Government was about to take over resources in the states at a time when Nigerians were calling for devolution of power. The Majority Leader, Senator Ahmad Lawan (APC, Yobe-North), however countered Akpabio, stating that the lawmaker was arguing in error. Lawan noted that the clause was in reference to waters like River Benue and River Niger, which flow through several states. He urged the Senate to ignore the issues raised by those opposed to the bill. Senator Gbenga Ashafa (Lagos East) supported Akpabio’s position declaring that the Nigeria Inland Water Ways Authority (NIWA) was already having inroad into Lagos State waters. Senator Ibrahim Gobir (Sokoto) said that the contentious provision was clear and should be adopted. Senator Solomon Adeola (Lagos West) cautioned that the entire Bill should be reconsidered since it has become controversial. In a bid to prevent the debate from deteriorating and creating more trouble, Senate President, Abubakar Bukola Saraki, said that the bill should be referred to an adhoc committee. made up of the Water Resources Committee Chairman, Shitu, Deputy Chairman, Bwacha, Chairman of the Senate committee Judiciary, David Umaru, director legal services and Senator Barnabas Gemade, to reconsider the clause and report back in one week. The Senate yesterday read President Muhammadu Buhari’s letter seeking confirmation of chairman and members of the Police Service Commission (PSC) appointment. Buhari said he wrote the letter in compliance with the provision of section 153(1)(m) and 154(1) of the 1999 constitution of the Federal Republic of Nigeria (as amended). The PSC newly appointed chairman is Musiliu Adeola Kunbi Smith who hails from the Southwestern part of the country. Others are two full time commissioners: Justice Clara Bata Ogunbiyi (rtd) and Lawal Bawa (rtd, AIG) from North east and North west respectively while Mohammad H. Najatu (North West), Braimoh Adogame Austin (South-South), Rommy Mom (North Central) and Dr. Nkemka Osimiri Jombo-Ofo (South East) are members. Also, Senate President Abubakar Bukola Saraki has inaugurated commissioners of the Public Complaints Commission (PCC). The commission has 36 commissioners representing each of the states across the country with Chileh Igbawua as Chief Commissioner. Saraki charged the commission to be proactive and focused in the discharge of its mandate and, urged the commissioners to prevent acts of injustice and abuse of power among Nigerians in order to make the nation a better place for all. He also noted that the PCC is the sole agency under the National Assembly with significant roles in strengthening government institutions.